Salem radio personality Heidi Hawthorne (Sheri Moon Zombie) has received an unusual package from what she believes is a new underground band calling themselves The Lords. She and her partners “Whitey” Salvador (Jeffrey Daniel Phillips) and Herman Jackson (Ken Foree) play it on the late night airwaves to see what the reaction might be, that evening’s guest, local historian and museum curator Francis Matthias (Bruce Davison), instantly curious as to where the record came from and who was responsible for its production. Back at home, Heidi is certain someone has moved down the hall from her into a supposedly vacant apartment, kindly building manager Lacy (Judy Geeson) doing her best to assure her this simply is not true. She also takes the time to introduce her favorite tenant to two of her most devoted friends, eccentrically catty Sonny (Dee Wallace) and plain-spoken psychic Megan (Patricia Quinn), women she refers to as her sisters even though it’s plainly obvious none of them are related. 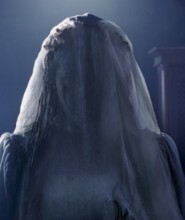 That’s all I’m going to reveal as it concerns Rob Zombie’s latest horror enterprise The Lords of Salem, although I’m pretty sure most can probably figure out what might be going on and where things are heading for Heidi. Safe to say, this story is set in Salem for good reason, and to surmise that something supernatural might be going on isn’t a gigantic stretch. To say I have not been a fan of Zombie’s previous films would be to understatement the obvious. I was okay with House of 1000 Corpses, but no more than that, while I found The Devil’s Rejects to be an abhorrent pile of trash I wouldn’t even want my worst enemy to to sit through and endure. As for the former musician’s 2007 remake of John Carpenter’s Halloween (and its 2009 sequel), the less said about those the better, neither worthy of a ton of thought, discussion or debate. 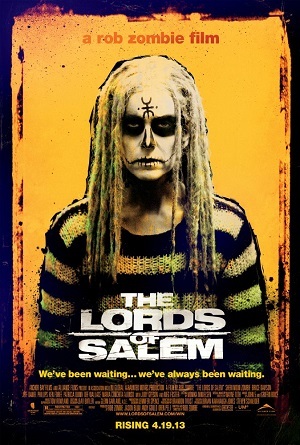 So I’m slightly surprised to admit that, for the most part, up until the whack-a-doo finale that doesn’t make a lick of sense, I was pretty darn impressed with The Lords of Salem. The movie is chillingly effective, moving with an unnerving precision recalling Robert Wise’s The Haunting, Roman Polanski’s Rosemary’s Baby and Ti West’s The House of the Devil. While the imagery can be a little psychedelically silly, while the gothic overtones can be on the heavy-handed side, the central emotional whirlpool is startlingly effective, the events circulating around Heidi that are attempting seduce her into embracing her inner darkness she viscerally compelling. For all his storytelling faults, Zombie has always been an intriguing visual stylist, giving his films a look and a feel that avoids many of the usual clichés allowing them to have an unnerving vibrancy uniquely their own. He takes that to another level here, Brandon Trost’s (That’s My Boy) self-assured camerawork navigating the claustrophobic confines of Jennifer Spence’s (Splinter) exquisite production design with aggressively uncomforting grace. The control he showcases, his allowances for silence and for serenity to speak for itself, his eschewing of the typical jump scares and obnoxious music queues, all of it showcases a maturation on Zombie’s part that’s impressive. I did find the climax a tad annoying, everything devolving into some sort of heavy metal music video montage that’s annoyingly nonsensical. The air of mystery surrounding Heidi’s ultimate destination is supposed to send chills down the viewer’s spine, is supposed to take our breath away and leave us shivering in questioning fear. Yet all I felt was dissatisfaction, thinking to myself that Zombie wasn’t certain where exactly it was he wanted to take things and instead decided upon a climax that’s too obnoxiously ephemeral and nauseatingly over the top for its own good. All the same, when the movie works it does so marvelously, the fact I sat in the theatre in frazzled rapt attention not a something to dismiss lightly. Tension ries throughout, while Zombie has also crafted great character parts for genre icons Stone, Quinn and the nakedly frightening Meg Foster I was awed by. Geeson does a deliciously malevolent intellectual ballet Ruth Gordon would stand up and cheer for if she were still around, while Davison exudes an authentic intellectualism that’s wonderful even though an air of tragedy circles around him ominously no matter how pure and selfless his intentions to aid Heidi during her time of peril might prove to be. Is it great? Sadly, no, I can’t go that far, the closing ten minutes a frustrating let down compared to 80 that had preceded them. Even so, the horror works on a visceral level that’s uncomfortably powerful, and even for a genre junkie like myself there are moments of terrifying brilliance here that are devilishly divine. The Lords of Salem is a giant step in the right direction for Zombie, and for a director I’ve thought precious little positive about in the past the fact I’m now excited to see what he’s got in store for us next is no small achievement.